Alan Buchanan designed the Nantucket Clipper. For sure, this is a wooden version, perhaps a prototype. Until I saw her I thought they all had fibreglass hulls and superstructures. She has the original underwater profile with the rudder adjoining the keel. Later versions had different rudder configurations. I’ve even seen one with a spade rudder. 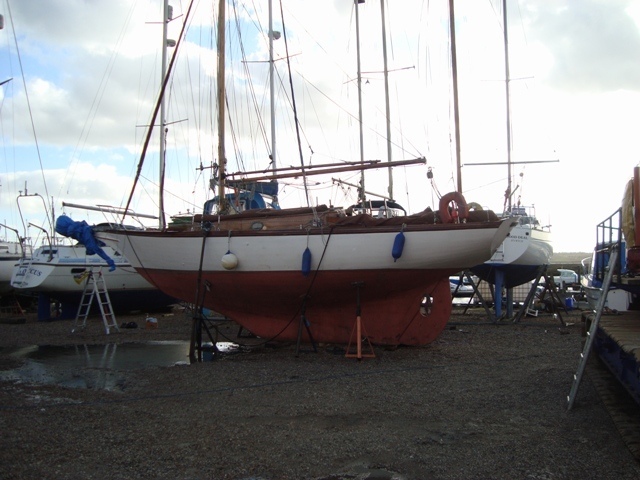 This particular boat is at Bridgemarsh Marina, with access to the River Crouch via the creek behind Bridgemarsh Island. Wasn't the cabin sole at an angle going forward? I remember seeing one at he boatshow if I recall, can't help thinking they would have been a better boat without the pastiche clipper bows. This one seems to have a gaff main. Although most of Alan Buchanan's designs are very attractive, I never liked this fake clipper look. Interesting. I own a Mk2 clipper. Lovely little boat kept me safe many time. My instructor when I did my costal, who ran a school in Alcudia Majorca, said he owned a wooden one. The moulds for the Mk1 long keel GRP version are laying 50miles north of Alicante. The owners of the moulds say they used to mould them and ship them bare back to UK. 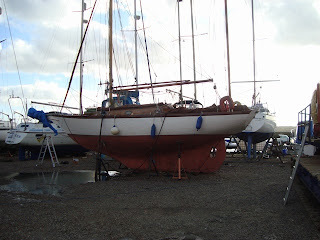 I have sailed the long keel and 3/4 keel as I own. The latter sails better and even goes backwards. Usefull in Med moore.